GP 2013 R2 has been released! 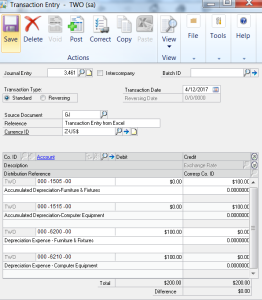 My favorite new feature you can look forward to is: Copy and Paste journal entries from Microsoft Excel into General Ledger Transaction Entry. 1. Description: Enter the description of the account. The description is not required. (Field can be blank). 2. Account: Enter the account to post transaction amounts to. 3. Debit: Enter the debit amount for the account on the same line. 4. Credit: Enter the credit amount for the account on the same line. 5. Alias: Optional 5th column if you are using Analytical Accounting. The second step is to copy the columns of data you want for your journal entry. (Note: Do not copy the column headings or you will receive errors when you paste the data into your transaction entry. You do need to copy column 1 for Account Description even if you are not importing this information.) The third step is to access the Transaction Entry window: Financial >> Financial >> General. Enter the Transaction type (Standard or Reversing), Transaction Date, Source Document Code, Reference, and Currency ID. The fourth step is to make sure your cursor is in the Account field. 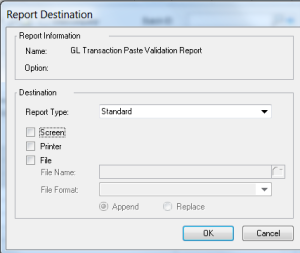 When you click Paste: If there are errors in your file, you will receive this Report Destination for the GL Transaction Paste Validation Report. Your data will not be copied into the window. Once you fix the spreadsheet, recopy and paste the information. If there are no errors in your file, the copied data will be placed into your Transaction Entry. 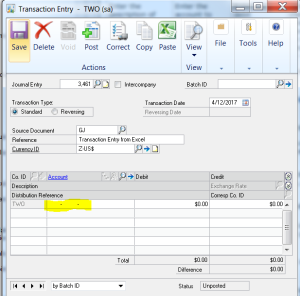 You can enter transactions in a batch or individually. Follow normal posting procedures followed by your company. If a batch is being used, save the batch. If this is an individual entry post. Let us know if you have any questions about this new feature. Watch for additional blogs on other new features included in this release. Contact us if you would like to schedule a time to install GP 2013 R2, robin@pnbsi.com.